I met Wendy when she was a client on BellSouth Mobility; she was one of the smartest and kindest clients I ever met. Ever. Was proud to work with her again at GSD&M. She went on to be President of Sparkling Brands & Strategic Marketing at Coca-Cola. 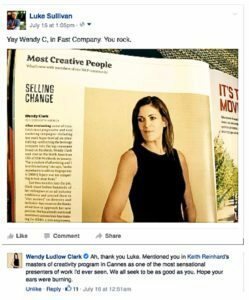 Now she’s CEO of DDB Worldwide and had a blurb in one of my fave mags, Fast Company. I swear, keeping an eye on the trajectory of Wendy’s career makes my neck hurt.